Mill End01263 715779work01603 870304fax Self-cateringAdjacent to the owner's conversion of a mill house dating from the 17th century, this property has also been renovated, now providing a very comfortable stay for guests. 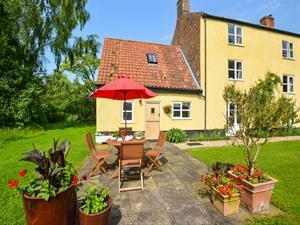 With a tasteful decoration, this property features modern utilities and a charming character. This area of Norfolk is ideal for spotting wildlife and routes for both walking and cycling are available to explore the surrounding countryside. • Other: Towels, Books and games provided. Stairgate - please request on booking. An attractive property attached to the owner's home. Mill End offers weekly bookings starting on Saturday. Adjacent to the owner's conversion of a mill house dating from the 17th century, this property has also been renovated, now providing a very comfortable stay for guests. With a tasteful decoration, this property features modern utilities and a charming character. This area of Norfolk is ideal for spotting wildlife and routes for both walking and cycling are available to explore the surrounding countryside.